A colourful building will act as a magnet and aroma of the food will increase your curiosity of what is cooking at Cafe Arcangel. The modeled dining room is the classiest place to have a perfect meal. Plan a Cuban breakfast, lunch and dinner here as they provide a number of choices to begin your day with! One visit is not enough to try all the scrumptious dishes here. It is an economical café with friendly staff and quick service. Cafe Arcangel is appropriately located to attract many tourists. Best coffee I've ever had! I think we went there every day for breakfast in Havana. Great place to eat for two American gals who speak very elementary Spanish! 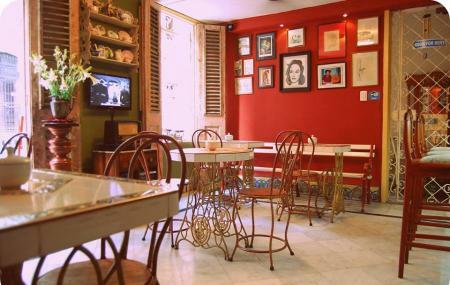 Lovely traditional Cuban breakfasts, vintage place and great service ! Probably one of the few nice places in Havana. Perfect for breakfast and a light lunch. Decent portions, good coffee and reasonable price. I liked Charlie Chaplin movies playing on loop. Personnal is a bit too chilled sometimes.